On May 27, the Guatemalan Public Ministry opened a criminal case against KCA’s subsidiary Exploraciones Mineras de Guatemala S.A (EXMINGUA) as they investigate the failure of the company to comply with court orders to suspend operation at the mine in San José del Golfo. A week later, on June 6, the Public Ministry launched a series of raids against the company offices as part of their investigation. The investigators located 76 bags of concentrate of gold and silver from the mine that the company was illegally exporting, as well as a number of Mayan artifacts that the company had presumably uncovered at the mining site. The firm and its owners could also face charges for crimes against the environment. The investigation follows a Guatemala’s Supreme Court decision on May 23, which stated that the mine in San José del Golfo was operating illegally. The case continues the case brought against the mine by lawyers from the Center for Legal-Environmental and Social Action (CALAS), which argued that the mine is illegal, and that the license for the mine must be suspended immediately. The advancement in the case stems from the February 22 decision by the Guatemalan Supreme Court of Guatemala, which confirmed the decision of a lower court and ordered the suspension of the license for exploitation for the controversial Progreso VII Mining Project, commonly known as El Tambor. Despite the court’s order, the Guatemalan Ministry of Energy and Mining stated that they would not suspend the company’s license for exploitation. Furthermore, the company also stated that they would not suspend operations at the mine, and took to lengthy extents to export material. The most recent Supreme Court’s ruling upholds a July 2015 ruling by a Court of Appeals judge, who agreed with the members of the peaceful resistance of La Puya, and determined that the mining company and the municipality violated the rights of the communities to a prior consultation, and ordered the mining firm to suspend the construction of infrastructure. 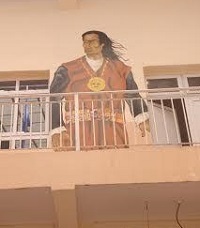 The owner Daniel Kappes and the firm’s lawyer have argued that they held a consultation; but Judge Angelica Noemi Tellez Hernandez clearly states that the firm did not hold consultations with the affected communities in accords with the Guatemalan constitution and international Labor Organization’s Convention No. 169. In the declaration, the judge called for “The suspension of all activities of the construction of infrastructure at the site of the Progreso VII Mining Project, while (the firm) consults the neighboring communities” about the project. The ruling gave the Municipal Council of San Pedro Ayampuc 15 days to ensure that the operations at the site ceased. But the mine failed to comply with the court order, and continued the expansion of infrastructure at the site, including the installation of their Internet networks. In October 2015, 12 Members of the United States Congress called upon then interim president Alejandro Maldonado to respect the July 2015 court ruling against KCA. But the mining firm has refused to comply with the court order, and argued that all infrastructure projects at the site had been completed. Furthermore, it states that these cases represent a violent attack on their investments. 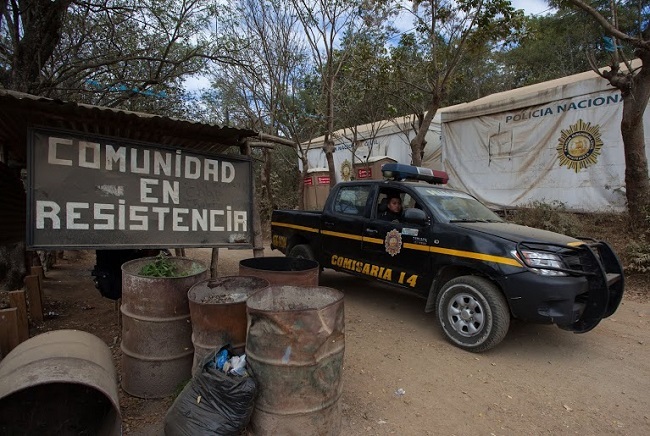 The decision comes after nearly 6 years of peaceful resistance by residents of the neighboring communities, who formed the La Puya encampment at the entrance of the mine to block any machinery from arriving to the site. An hour north of the busy, chaotic, streets of Guatemala City sits the municipality of San José del Golfo, which has been thrust into the spotlight of the grassroots media. Since 2012, this once peaceful community has been turned upside down by the arrival of transnational companies, initially by Canadian mining firm, Radius Gold, which eventually sold to US mining firm KCA, seeking to exploit gold and silver reserves in the hills just outside of town. Fearful over the impacts on the water and land, communities organized to challenge the mine. The communities near the mine have organized to challenge the project, which is operated by KCA. The communities fear that the mine will lead to the contamination and destruction of their precious land and water. Furthermore, the project in the municipality of San Pedro Ayampuc there exist 18 permits for exploration alone. The communities had seen the environmental damage that the other mines in Guatemala had caused, including the destruction of the environment and the impacts on health. The communities were also inspired by the teachings of the Catholic Church, and began to form the La Puya peaceful resistance to the mine. Communities have since early 2016 maintained a presence outside the Ministry of Energy and Mining in Guatemala City demanding that the ministry comply with the court’s decision. 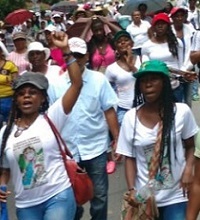 KCA has argued that the protesters are disrupting their production at the El Tambor site. But the protesters haven’t disrupted the exportation from the mine, a concrete-like material, which contains gold, silver, and other metals called a concentrate. 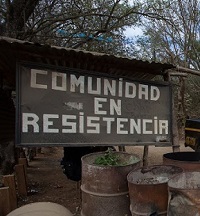 According to Kappes and Dieguez, the mining project began operations following the violent eviction by the Guatemalan National Police of the La Puya resistance on May 23, 2014. The first exportation of material was made in October 2014. At the time of operation, the Tambor mine was processes nearly 200 tons of earth daily. The rocks and ore are ground to the powder, and then packaged in large white squares, weighing a ton each. Jeremy Rozelle, a technician from Colorado who is the site manager at the Tambor mine, was quick to point out that this is a tiny amount when it is compared to other mining projects owned by Canadian firms, such as Goldcorp’s Marlin mine in San Marcos, or Tahoe Resources’ El Escobal Mine in San Rafael las Flores. In the first shipment of concentrate, the firm exported 28 tons of material. Despite the fact that El Tambor is a gold mine, the site does not produce gold bars. According to Rozelle, this has become a common occurrence in the mining industry, with smelting becoming done outside the country of origin. When asked where the material is exported to, Rozelle declined to comment. But according to documents obtained from the Guatemalan Ministry of Energy and Mining, the concentrate is shipped to smelters in 8 countries: Japan, South Korea, Germany, Belgium, Canada, the United States, Mexico, and China. But according to International Mining expert Dr. Robert Moran, herein lies one of the major problems with the state of the mining industry in the 21st century. Since the court’s decision in early 2016, the mining firm has taken new steps to move the concentrate from the mining site. This has included the use of a helicopter to lift the one ton blocks of concentrate from the site. KCA has stated that they will challenge the recent court orders with a lawsuit over the violation of the rights of investment, as laid out through the Central American Free Trade Agreement. The firm argues that the Guatemalan state has violated their right to their investments through accusing them of illegal mining. This case in Guatemala threatens to mirror a similar case in neighboring El Salvador. Canadian mining firm Pacific Rim began operations in El Salvador in 2002, and quickly identified a gold reserve along the Lempa River in the department of Cabañas. In accordance with the Central American Free Trade Agreement (CAFTA), the company did an Environmental Impact Report for the operation at the El Dorado gold mine. But after repeated attempts, it failed to receive a permit for exploitation. Residents of the area affected by the mine organized to challenge the company over concerns that the mine would pollute their precious groundwater. In response to these concerns, the government of El Salvador repeatedly declined issuing Pacific Rim a permit to exploit the gold reserve at the El Dorado mine. The government of El Salvador also weighed the idea of banning all mining within the country. But this ban was never passed. In response, Pacific Rim sued the government of El Salvador in 2008 for $100 million. But in order to utilize provisions in the CAFTA, which do not apply to Canadian firms, Pacific Rim had to move the ownership of the mine to the United States. “In an effort to force El Salvador into a decision, Pacific Rim reincorporated its Cayman Islands subsidiary Pac Rim Cayman, LLC (Pac Rim) in Nevada, and transferred ownership of El Dorado from Vancouver-based Pacific Rim to the U.S.-based Pac Rim,” wrote attorney Katie Zaunbreche in the Houston Journal of International Law. By doing this, the firm could fall under Article 10 of CAFTA, which protects the rights of US based companies to their investments. The case then went before the little known International Centre for the Settlement of Investment Disputes (ICSID) at the World Bank, and is still pending a decision. The Pac Rim vs. El Salvador case isn’t the first time that a company has used a free trade agreement to defend their rights to investment. In 2000, the California based waste-disposal company Metalclad Corporation successfully sued the Mexican government after the state of San Luis Potosí expropriated the corporation’s investment in a land fill for an ecological reserve. The firm received $16.7 million in damages. “If successful, Pacific Rim would contribute to Metalclad’s troubling precedent in the region, wherein the law sides with the interests of multinational corporations over the health, safety, and welfare of local populations,” wrote Zaunbreche. Furthermore, Alexandra Pedersen argued in her August 2015 article for Telesur that mining that cases such as the Pacific Rim case in El Salvador are major contributors to undermining democracy in Central America. The same can go for cases in Honduras and Guatemala, where Canadian mining firms have been involved in corruption scandals and the 2009 Coup d’état in Honduras. These cases also set a dangerous precedent where companies like Pac Rim can sue governments that seek to stop projects that threaten populations. The continuation of the conflict over the Tambor Mine in Guatemala potentially could lead to yet another case of a company suing a government of Central America over mining.